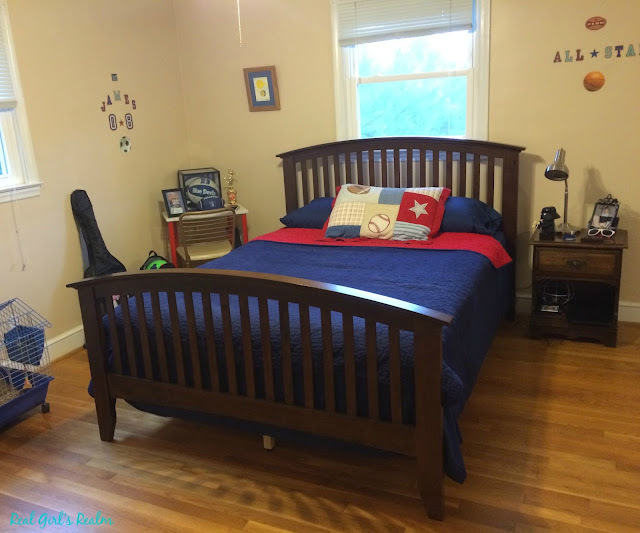 My teenager had outgrown his twin bed so we decided to move the Queen bed from the guest bedroom into his room and update both rooms at the same time. 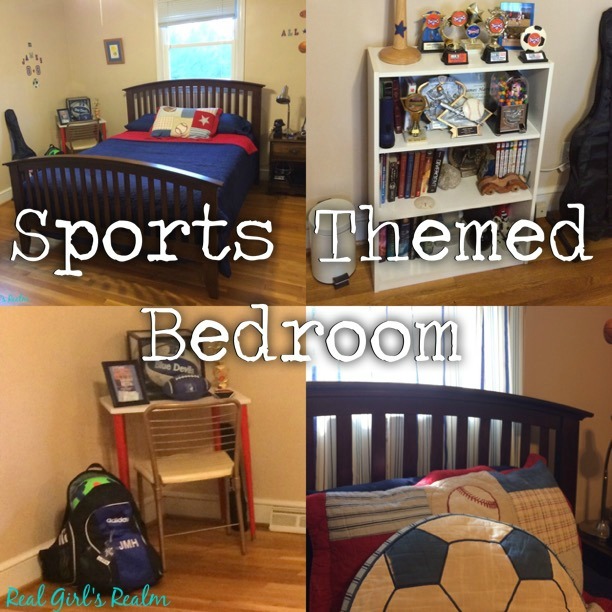 His bedroom was previously a baseball themed room, but since he was currently into soccer and basketball, I went with a sports theme. My Sister in Law had given me a reversible red/blue quilt that she was no longer using in her son's room, so I found a sports themed pillow sham at Target to match. I used a solid navy sheet set and red fleece blanket to complete the bedding. I picked up some fun, sports themed wall decals to decorate with as well. I added his jersey number and name on one wall and a basketball with the words "All Star" on the other wall. 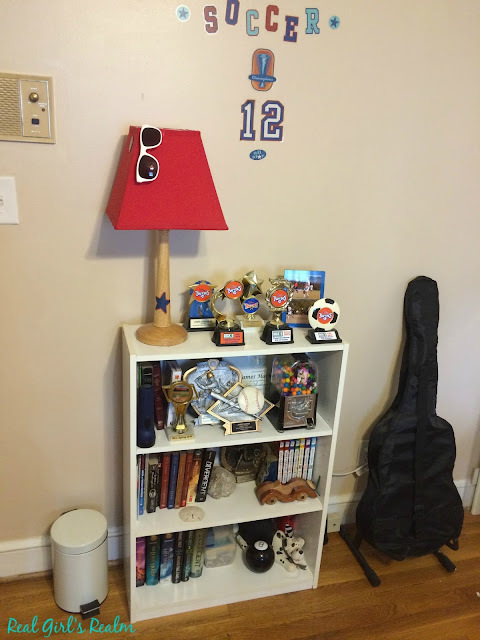 My husband had built the baseball home plate shaped desk for the baseball themed room, so we decided to keep it in the corner for him to display his sports memorabilia and basketball trophies. 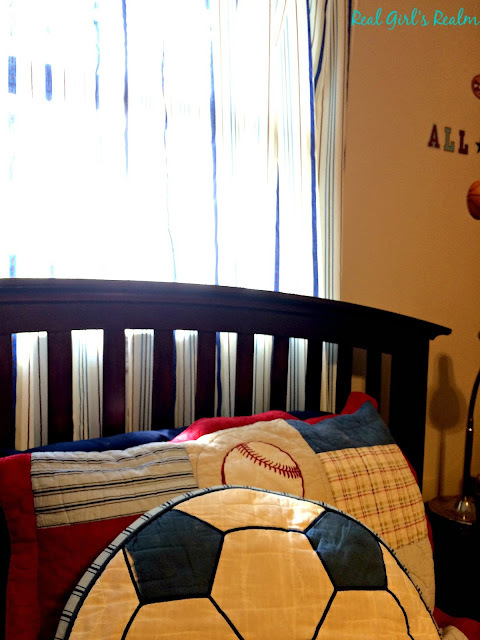 I added some striped tab top curtains (from a discount store) that match the bedding set and found a soccer ball pillow at Target for a fun accent. I put the dresser inside the closet to save space, since the room is not very big. He only uses one side of the closet for hanging clothes, so this works well. 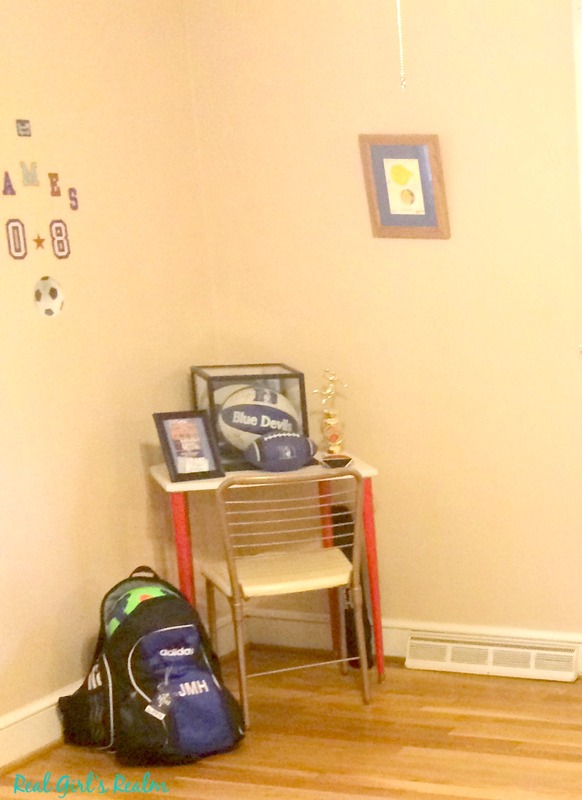 Now my teen has a more functional room and a bed he can actually fit in! What do you think? Would your teen like this bedroom? Target is the best for cute and inexpensive decor!! Yes, Target is my favorite! I know; its awesome...we rarely use it, but Jay liked it when we first moved in. Thanks Melanie! That's awesome! I did not realize your house had one too...it doesn't seem old enough! The boys would have a field day if it worked! This looks awesome! 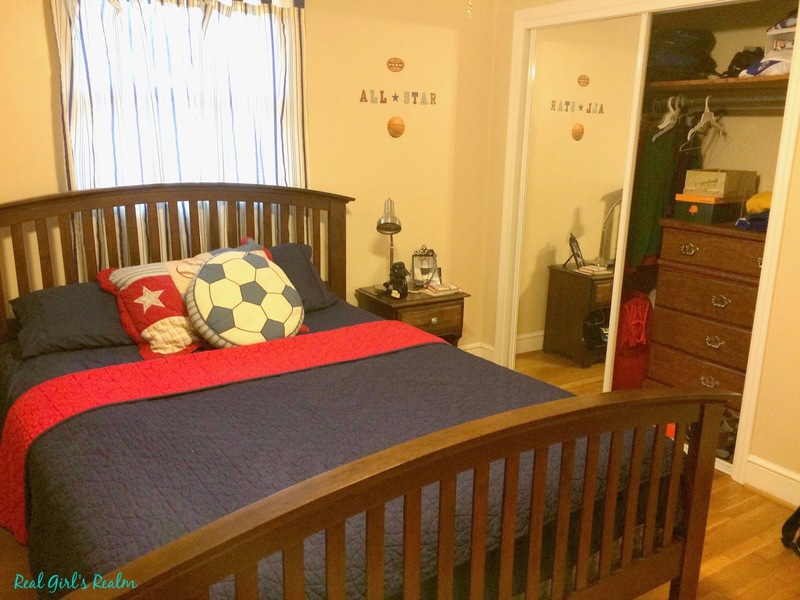 We are in the process of redoing my kids rooms for a new baby! Thank you Linsley! I hope I have given you some inspiration! The room looks great! Nice makeover!